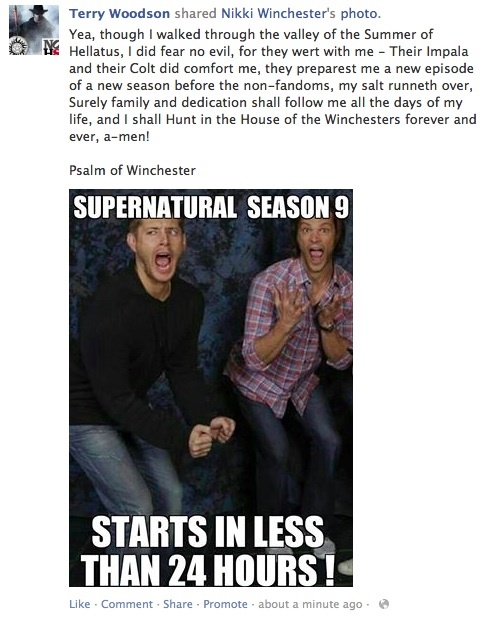 I Am the Supernatural Prodigal Fan. Thought it was appropriate that I re-air my confessions, what with season 9 starting in under 24 hours! If you’ve read before, please ignore. If not – here is my #Supernatural Story! Hello, my friends! I have something special I want to share with you today. Some of you will understand. Some of you may hate me for it. Some of you may even forgive me at the end. I have a feeling that most of the people who will read this blog are people who belong to my “Supernatural Fandom Family”. Any fan of the show knows immediately what I mean by that statement. If you don’t understand, you either haven’t watched Supernatural at all, or, for some reason that i cannot empathize with, aren’t a fan. I personally have never met anyone who watched this show at least once and not became a fan of it. I am proud to say that throughout the series’ 8 year history, I never missed an episode when it aired live on TV, the night of it’s first airing, for seven whole years.